NYC, 04/26/2019, 2:00PM. 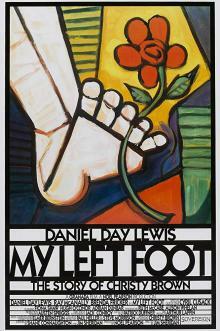 My Left Foot (1989): Two Time Oscar Winning . Starring Daniel Day-Lewis, Brenda Fricker, Alison Whelan. Day-Lewis won the Academy Award and the BAFTA Award for Best Actor, while Brenda Fricker won the Academy Award for Best Supporting Actress. The film was additionally nominated for three other Oscars, including Best Adapted Screenplay for Shane Connaughton and Jim Sheridan, Best Director for Sheridan and the Academy Award for Best Picture.